As expert stone workers, at Surrey Marble and Granite we’re often called on to undertake more unusual commissions. 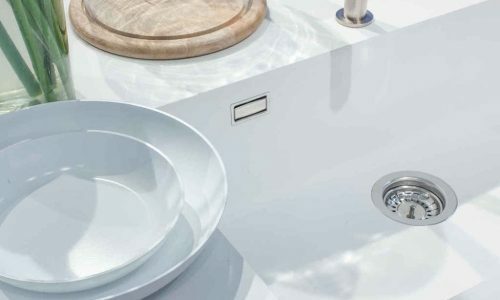 While our show room focuses on kitchen worktops, bathrooms and other domestic projects, we can outfit anything from a offices to super-yachts and our customers often ask us to get creative. Here are five quirky uses for marble and granite which can create a statement feature in your home or garden. 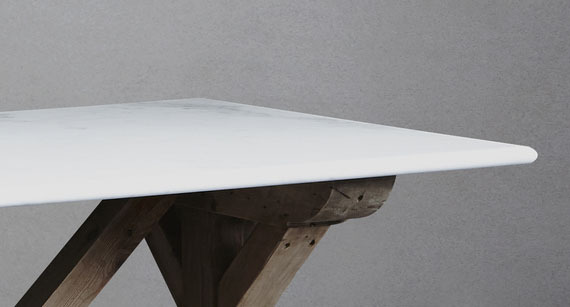 Marble worktops are common enough, but have you ever thought of making the whole table out of stone? Marble and granite tiles are beautiful, and each is unique, so they’re a great way to turn an end table into a work of art. Stone is self-supporting so it’s easy to use. There are lots of quirky designs using large stone tiles. The simplest are four tiles joined in a square. Laid on one side, this makes a charming end table. A ‘dice’ shape design, with each face a different colour, is a lovely quirky idea. Tiles that aren’t square offer even more design options. By using a wood frame and tiling the top even more options are available. Stone tiled tables don’t mark or stain when a glass spills or a hot cup is put directly on the surface, so they’re practical as well as beautiful. Some tables are carved completely of marble and granite. They’re much heavier than tiled tables, so caution should be used when placing them in upstairs rooms, particularly in older houses. Rather than trying to make everything match, a patchwork patio is a striking creative choice. Stones can be all the same size and shape or irregular for a more natural look. Limestone is a popular choice, although many people with marble and granite interiors choose to continue the same stone outdoors to create a feeling that the garden seating areas are part of the house. Marble and granite tiles come in an enormous range of colours. While most people choose to tile an entire floor or wall in the same shade, with perhaps a stripe or two, it’s possible to lay tiles in a contrasting colour to create a pattern. As an example, a ring of hexagonal tiles looks rather like a flower, while stripes across herringbone tiles can look like a wave. These contrasts can be used to make a visual feature or perhaps to mark a path or boundary, such as creating a visual divide between open plan rooms. Museums around the world feature objects made of marble and granite, and some showcase unshaped slabs. These stunning natural stones are formed by natural processes over thousands of years. As a result, each slab or tile is unique, and some are truly breathtaking. We might be biased, but as a statement wall or a piece of art in a damp area like a bathroom or sauna, you can’t beat the wonders of nature. The struggle to create the ideal living space is only made more challenging when it has to be seaworthy as well. At Surrey Marble and Granite, our wide experience as professional stoneworkers makes handling the challenges even a super yacht presents simple. Working directly with the owner, with the builder or a project manager, our goal is to create a luxurious yet practical space that works as well underway as it does on the design drawings. Many business owners don’t consider stone for their commercial premises, even if they love their granite worktops at home. As it’s an incredibly durable, easy to care for material, it’s an excellent choice for many businesses, from bakeries to bars.